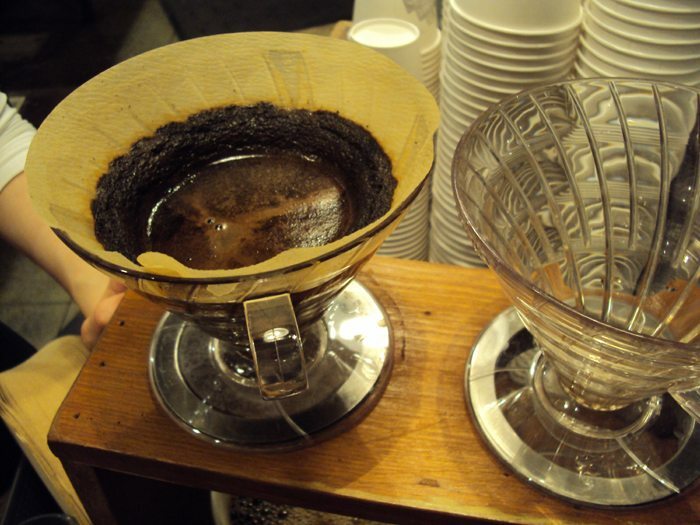 The “pour over” brew method is coming to Starbucks soon. Just yesterday, I posted a blog entry about how inconsistent a customer will find the Starbucks “brew on demand” policy. In the comments to that blog, two Starbucks partners both hinted that their stores would be receiving pour-over brew method equipment soon! I tried to get a sense if this was simply a regional test or everywhere, and never got a clear answer. A few partners contacted me privately through either twitter or other means of contacting me, each confirming that pour over is coming soon to their stores. Either this is going to be a test in multiple regions, or a nation-wide launch. 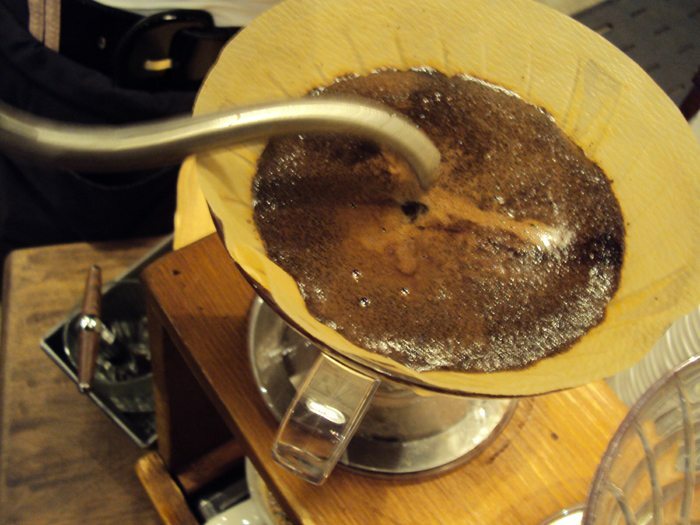 Is “pour over” coming to Starbucks a good thing? ABSOLUTELY YES. The two “mercantile” non-branded Starbucks are already using the “pour over” as one of their primary means of brewing coffee. For those who are unsure what the “mercantile” Starbucks are, please click here. 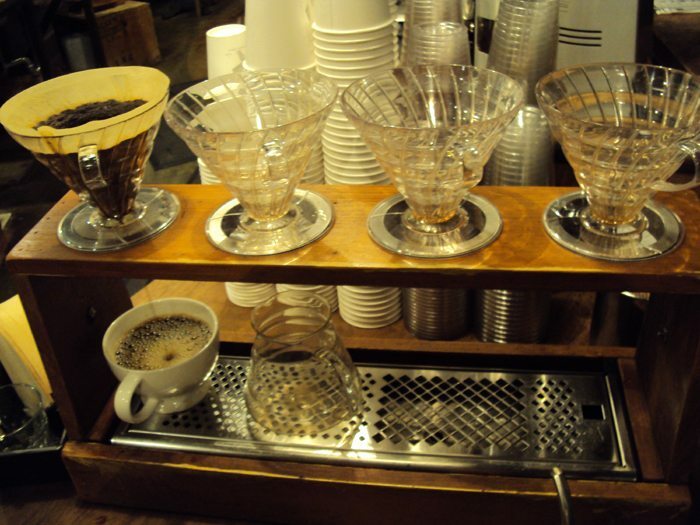 A “pour over” involves a barista grinding enough beans for a single cup of coffee, using a cone brewer with filter, and then custom brewing one single serving of coffee by pouring hot water over the beans. This brew method produces a coffee flavor close to the flavor profile from larger drip brewers because it is a brew method that uses a filter, unlike either a French press or a Clover cup of coffee. 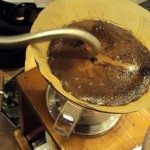 If one were to talk about four possible coffee brew methods, one would say that (1) “pour over” and (2) drip-brewer are very similar and (3) Clover and (4) French press have similar coffee profiles (though there is a larger difference to me between the Clover and a press, than as between the “pour over” and the drip brewer, in my humble opinion). This is such great news that the pour over is coming to Starbucks. 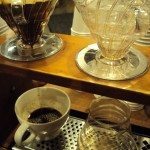 I remember hearing a rumor about six to eight months ago that the pour over was tested in Boston, but I never did get a chance to see it there myself. 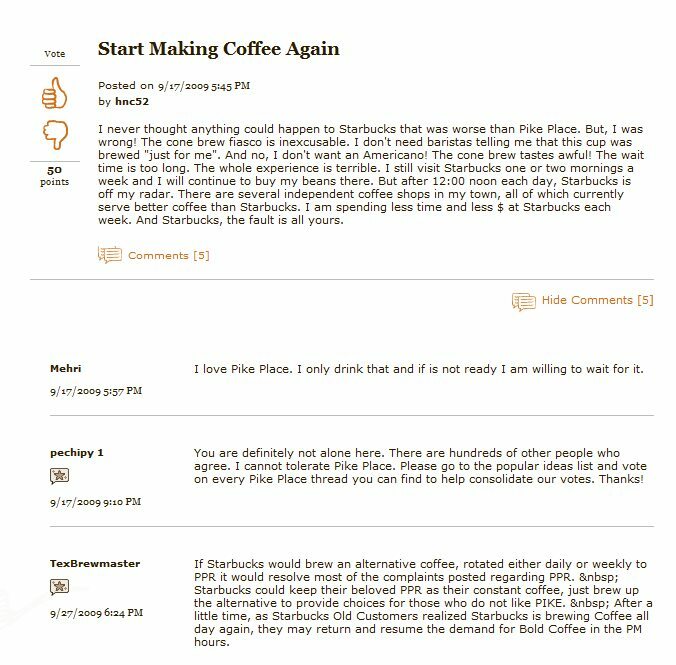 Previous mystarbucksidea.com threads, such as this one here, have long led to me believe that Starbucks has been experimenting with the “pour over” for quite a while. 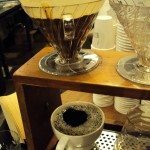 At times, customers have come to My Starbucks Idea to request that Starbucks implement a “pour over” brew method, such as with this thread here. I believe this is absolutely the right direction for Starbucks to go because it reinforces their fabulous bean variety; it is a great move in the direction of being about the coffee; and gives the customer great choice. My only worry for this option is that it is fairly labor intensive and slow, and I worry that customers will not want to wait and baristas will not have enough labor to make this work. I guess time will tell. I also have a small worry that baristas will receive inadequate training to make this really effective and premium cup of coffee for the customer. 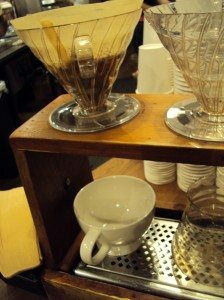 There are a few large suppliers of “pour over” cones: Two in particular that Starbucks has experimented with are (1) Melitta brand, and the other is (2) Hario USA brand. I don’t know which would be used for the wide-scale “pour over” launch. Place paper filter in plastic cone. Pre-wet the paper, and toss out the little bit of water from pouring water all over the paper. This helps rid the coffee of any residual paper flavor! Grind beans on a setting a little coarser than espresso grind. Pour the ground beans into the paper filter. Measure out the right amount of hot water, which should be very hot at 202 degrees. Pour the water skillfully in the center of the beans. When I posted yesterday’s blog entry on “brew on demand” I had no idea that something new would grow out of the comments. I had been slowly writing that blog, and it sat in my drafts half-written for a month. Finally, I figured I might as well post it. Looks like my timing wasn’t bad at all! 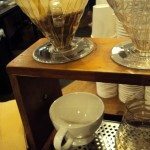 If any baristas have any thoughts about the “pour over” or any other brew method, please chime in! [[Edit on 2-7-2010: From conversations with baristas, I am getting the sense that the “pour over” launch is about one month out from now. 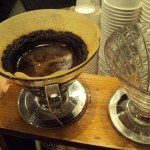 One more thing: I wanted to provide a little more information on the “pour over” brew method, and stumbled upon this blog which gives some detailed information about brewing with the Hario cone. Hand brewing with the Hario. Commentary: Starbucks Brew On Demand - The experience in the stores. Melody – This will certainly increase exposure to the concept of single cup brewing in North America. New businesses can get away with soft openings and iron out a lot kinks. However for sbux once past the test market phase there’s no “soft openings” and you can only make ONE first impression. It seems they’re making a safe bet in the interest of the bottom line today. The rules make a lot of sense for sbux to save $ and minimize waste on decaf and bold coffee of the week. The bottom line tomorrow I believe will hinge more on lasting and authentic value. Not just the responsible trimming costs and running lean. Regardless it is certainly an exciting time in coffee. If you’re imagining that there’s a LEAN on the pour-over method, you’re right. “Proficiency Time” for a grande pour-over is 174 seconds. According to communication, the pour-over station should only be utilized at “non-peak” times when decaf and Bold Pick of the Day are not being brewed in the Bunn Digital Brewer. Of course, “Just Say Yes” trumps all. Additionally, communication makes clear the fact that stores serving two or more units of either bold or decaf per half hour period respond to demand accordingly by brewing quarter batches through the digital brewer to save on labor and customer wait time. The problem with this? Most customers are practically forced into drinking PPR or an americano. Heck, most stores don’t even ask which coffee a customer would prefer when they simply ask for “a coffee.” This issue is directly addressed in the Spring Promo materials. So, fortunately, stores will be forced to re-assess the coffee preferences of their customers whereas before, stores simply “stopped brewing bold and decaf at noon” whether people liked it or not. There will be several fun and intriguing elements centered around our bold coffee offerings starting in early March with the new promotion. Melody, you’re gonna geek out! Pour over can be done in any size. My store launched it today and I enjoyed a delicious cup of Espresso Roast as I worked the till. As far as the next promotion goes, it looks like the customer passports that Melody loves so much are coming back just for the duration of the 8 week promotion. A different bold coffee will be featured each of the eight weeks so that customers have a chance to try a new coffee each week. I wonder if we’ll ever again brew Kenya, Sidamo, Guat Antigua, French Roast, Espresso Roast… not to mention Breakfast Blend and Shade Grown Mex… just what is the point of having a “core” coffee that never gets made in your stores? As a barista, who normally works nights, I say YES to the pour over method! I will never have to say “We don’t have any decaf or bold brewed” again. We have tried the pour over and it is great. Yea Starbucks, this is a step in the right direction. 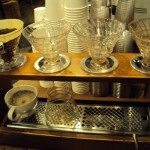 I just saw the pour over equipment in one of the stores I frequent regularly. I am excited not for myself, but for the average Starbucks customer. As a former partner, I still have personal connections with many store partners and also know exactly what to say in order to get partners to fulfill the policy of brew on demand, or having a french press brewed for a specific coffee. By integrating a simple method into the daily operations, This will become the norm instead of the outlier situation, and brewed coffee drinkers can start feeling appreciated again, instead of being treated like afterthoughts in a frappuccino and carmel macchiato world. sad that it’s only decaf and ONE bold…we should be getting customers to try new and different beans! Although I DO agree about the French Press. I bought one right after I was hired and it is my preferred method. I even brought it on a trip with me ( I think family/friends thought I’d gone off the deep end). Pour over seems like it COULD be a happy medium IF Starbucks would allow it to be. Hey but CABarista, the link I added above with today’s edit says US and Canada! I thought it was going to be both markets getting the pour over. Customer: No more bold today? Customer: So I guess I’ll take what you’ve got. Barista: Okay, Pike Place it is. The average barista shuns any and every opportunity to create extra work for themselves, not to mention probably can’t even describe the difference between coffees. When I started with Starbucks in 1996, if you didn’t like regular coffee, you probably weren’t hired by the manager. Now, lack of coffee knowledge is accepted, as long as you show up for your shift. Just my two cents, trying to survive as a brewed coffee drinker in a frappuccino world. Being the “OMG what’s wrong with this picture now” guy, my only question on this “next big thing” promo is that I was taught during my first brew event training that coffee is supposed to brew at 205F in order for a optimum product. This is not the temp that comes out of any spigot and when I tried to steam water I could only reach 201F. But I did brew espresso this way at 201F today and it made a nice short. Starbucks may have begun, exclusively selling beans & serving drip coffee. But let’s face it-Starbucks has become bigger than that now & we cater to EVERYONE (Adults, Children, Families). It’s no longer just about serving great coffee, but it’s about providing an unbelievably exceptional experience for each & EVERY customer! From the moment our guests enter the store & get greeted on a 1st-name basis, to getting their drinks started while they’re waiting in line, to chit-chatting w/the barista @ the register & learning about new & upcoming pastries/drinks/offers/promotions/inside-tips, to looking forward to getting their drinks, as we thank them w/ a smile & wish them a GREAT DAY, these are ALL part of the 3rd Place Starbucks Experience! I’m SURE you’ve experienced this, right? I’m blessed & proud to say that this occurs @ my current store EVERY DAY; not because we HAVE TO, because WE WANT TO! Surely, this doesn’t happen @ EVERY store. I’ve worked @ many SBUX’s in the past. Some may require improvement, some may not require as much. Nothing is perfect. For me, I’m all about the PRESENT time-not about how it used to be or how it’s going to be; I leave ‘how it used to be’ in the past & I leave ‘how it’s going to be’ a surprise! Your scenario (above) may be typical & common to occur as ‘Pour Over’ proceeds. However, it has not occurred YET. When something hasn’t happened yet, despite the obvious (which I intentionally overlook), I LOVE keeping things open-ended, preoccupying myself w/ the notion of “Let’s just see! – You NEVER know!” This way, I have the most impartial perspective instead of manifesting 1 way or another & setting myself up for disappointment. When customers receive the overall, exceptional service @ SBUX that they deserve, an issue of seasonal pastries being seasonal or the pour-over method becomes a mere spectacle in their mind, LIGHT YEARS away, because suddenly, they realized that they adored how they JUST got treated. Despite its ups & downs, 1 thing, especially, that I’ve always admired/loved about Starbucks, is that they keep trying to improve & attempt to keep up w/ the current times by focusing on the entire Starbucks picture as a WHOLE, while STILL not forgetting its roots by working diligently & closely w/ the coffee farms, giving back to the communities. When I was a waiter, a co-worker tipped me, “So what if you have 6-7 tables to wait on? Try to oversee your ENTIRE station of 6-7 tables as 1 GIANT one! THAT’s how you serve tables…” This is what Starbucks is doing. I have been disappointed with my “pour-over” coffee. Local Starbucks don’t brew decaf after 3PM and since I am pregnant, I have had the opportunity to try coffee using this new method about 5 times at 3 different Starbucks. The first one I had was lukewarm, had coffee grounds in it, and I fished out a piece of black plastic. I threw it away. Hoping it was a fluke I continued to try it a few more times because I LOVE Starbucks coffee. Sadly, they have all been lukewarm with a weak watered-down taste. If I can get to Starbucks before the afternoon, then I gladly pay for my brewed coffee, but anytime in the afternoon or evening, I have sought out other local coffee shops for a nice brewed cup. @Erin, I have the same complaint about the pour-over – the lukewarm coffee is not appealing. 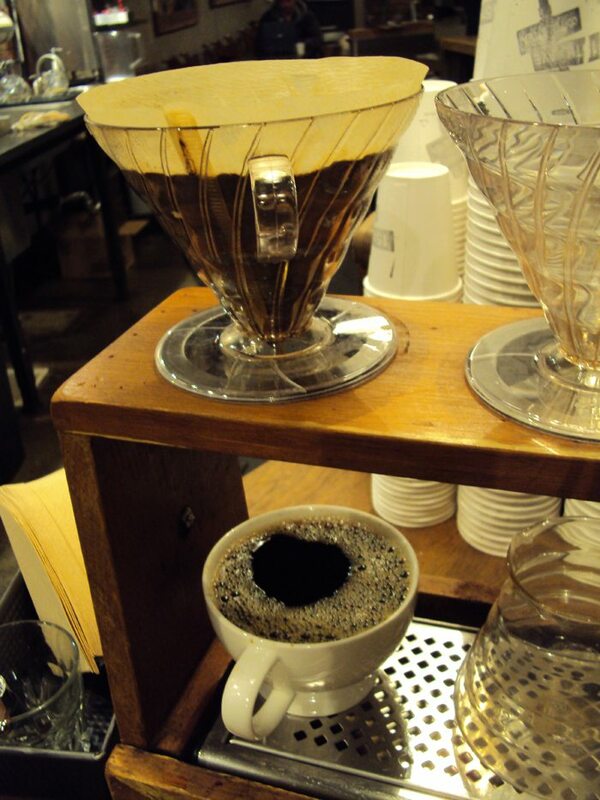 2) Make sure the barista pours a little water into the metered pitcher, dumps it out, then pours again. Some of that water is sitting in a holding tank. It is hot, but not as hot as what will come out after that first bit is cleared. 3) Go back to the bar/register after about three minutes and POLITELY ask if your coffee is ready. Sometimes the barista has gone on to another customer (or two, or three) and has forgotten your brew-over. Even the best barista will get distracted and forget you are waiting. Baristas are always doing several things at once (even when there are no customers!) and in the meantime your unattended brew-over is cooling off. 4) If you are going to stay and would like to have a few cups of coffee, and really love great, rich tasting coffee, order a french press. Ask them to use their insulated press, if they have one. You can request any blend of coffee they have available–they will open a bag off the retail floor if they have to! Ask for a for-here cup with it and you can enjoy great french press coffee out of a homey ceramic mug. I was so exited last night when I seen a pour over set up at my local star bucks. I have heard such wonderful stories about the life changing taste of the new pour method. The Batista was not nearly as enthusiastic at the thought of making it so I settled for a cup of drip. He offered and pretended not to mind accommodating my request but his face told a different story. I know he would have rushed to process and I would have a bad first experience. If starbucks is serious about promoting this method I advise they train some of the lazier baristas to complete the tedious preparation with a positive attitude. As a pour-over fan, I have found great inconsistencies in starbuck’s baristas’ methods. One problem, at all Starbucks, relates to heat. Plastic cones are used, which, even if they are pre-heated, do not hold the heat as do ceramic cones. 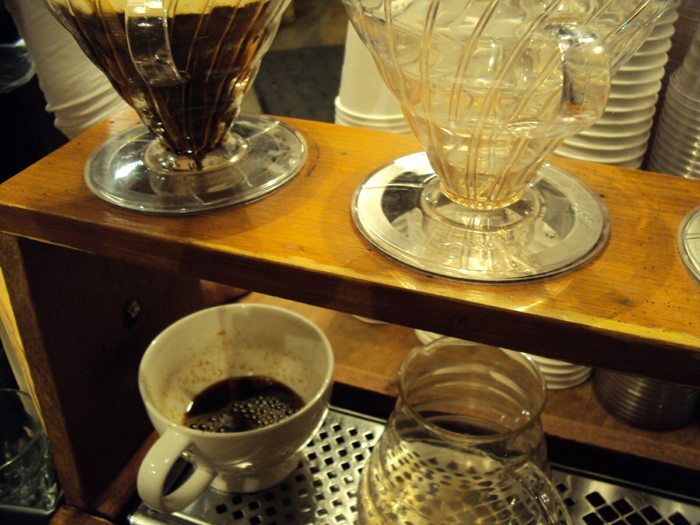 Second, the cones are high up in the holder, and the 2 or 3 thin streams of escaping brewed coffee drop a good 6-8 inches on their way to the waiting cup (often not pre-heated), resulting in the streams being effectively convection-cooled as they speed through the 70 degree air, as opposed to dropping from a warm ceramic cone directly into a pre-heated ceramic cup sitting right under it. And at the last Starbuck’s I ordered at, while the barista was friendly and accommodating and had time, he did not fold the seams of the filter, did not moisten the filter or do any pre-infusion–just dumped the hot water quickly in over the dry coffee and filter. So my overall comment is this: if you’re ordering a pour-over at Starbuck’s simply because you want a particular bean that isn’t available pre-brewed, fine. But if you’re also ordering it to experience the best qualities that can be brought out by a really intentionally prepared pour-over, go to a good “local” coffee shop, where they have implemented it properly after learning how to really do it right. For me, it’s $2.50 for a tall instead of $1.85, and enjoy the difference.